Everyone who uses a PC or Mac gets told not to use easy to guess passwords like “123456” or “password” . As it turns out – people obviously aren’t that bothered as they still use them. Password management application provider SplashData on Tuesday released a list of the 100 Worst Passwords of 2017, compiled from more than 5 million passwords leaked during the year. For a fourth consecutive year, “123456” and “password” took the top two spots on the list.The list included plenty of other usual suspects like “qwerty” (No. 4), “football” (No. 9), “iloveyou” (No. 10) and “admin” (No. 11), along with some new additions, including “starwars,” which ranked as the 16th worst password of 2017. The company recommends using passphrases instead of simple passwords, mirroring advice earlier this year from the National Institute of Standards and Technology. Passphrases should include at least 12 characters and a mix of characters, including upper and lower cases, SplashData recommended. Users should also be sure to set a unique password for each website, and consider using a password manager. Without further ado, here’s SplashData’s list of the top 25 worst passwords of 2017. To see the full 100, click here. A scam text message has been doing the rounds stating that WhatsApp is about to start charging people to use the service. It is not true. The text message invites people to click on a link and pay 99p for a lifetime subscription to the service because their current subscription has come to an end. However, it is a scam and anyone who receives it should delete it immediately, do not click in the link and certainly don’t hand over your bank details. If you have clicked the link then you’re probably wise to run antivirus software. When it was launched, WhatsApp did charge 99p after the first year but that was later scrapped. It was not immediately clear where the scammers had got people’s telephone numbers from. and comes from an unofficial-looking @msn.com email address, urges the user to reply via email with their full name, username, password, date of birth, and country in order to confirm their identity. In case the message seems a little abrupt, the would-be thieves who constructed this email provided some helpful tips at the end of the email about managing email accounts. Of course, Microsoft would never ask you to confirm your identity in this fashion – especially not by sending your password in an (unencrypted) email. But less security-savvy computer users might be duped into believing it is true, and respond with all the information the cybercriminals want, before having a chance to think twice. It’s a highly unsophisticated attack – but if it works against just a small number of people that the spammers send it out to, what does that matter? Don’t be a cybercrime statistic, make sure that you, your friends and your family are wise to such tricks and don’t share your login information with anybody. Almost 6.5 million LinkedIn passwords have been posted on the internet in a massive security breach to the business social network. Sophos report that , a file containing 6,458,020 unsalted passwords is being targeted by internet hackers, with the IT security and data protection specialists recommending LinkedIn users changed their password immediately. 1. Members that have accounts associated with the compromised passwords will notice that their LinkedIn account password is no longer valid. 2. These members will also receive an email from LinkedIn with instructions on how to reset their passwords. There will not be any links in these emails. For security reasons, you should never change your password on any website by following a link in an email. 3. These affected members will receive a second email from our Customer Support team providing a bit more context on this situation and why they are being asked to change their passwords. Facebook users who have clicked on the link claiming to “Enable Dislike Button” , could have experienced problems. Messages claiming to offer the opposite to a like button have been appearing on many Facebook users’ walls. Like the many scams which have come before it, the scammers have managed to duck under the Facebook security wire and replace the standard “Share” option with a link called “Enable Dislike Button”. Despite the fact that the “Enable Dislike Button” link does not appear in the main part of the message, but lower down alongside “Link” and “Comment”, it is still likely to fool some users into believing that it is genuine. There is no official dislike button provided by Facebook and there isn’t ever likely to be. But it remains something that many Facebook users would like, and so scammers have often used the offer of a “Dislike button” as bait for the unaware. It appears some people have no morals or conscience. There are a number of scam emails doing the rounds , purporting to be from the British Red Cross appealing for donations to the Japanese disaster fund. The email directs you to a website called MoneyBookers and requires you to make your donation through a Yahoo email address. Don’t be fooled. If you want to make a donation go direct to the Red Cross website. Please note: Unfortunately there are currently some fraudulent emails circulating claiming to be raising money for the Japan Tsunami Appeal, please be aware we will never ask for people to donate through companies such as Western Union or Money Bookers. We have not sent any emails soliciting donations for the Japan Tsunami Appeal. They may direct you to a fake website where you are asked for credit card details. They may offer you a position collecting money on their behalf for a percentage, retaining the money you send or using you to launder money from criminal activities. They may ask you to donate cash through money transfer companies such as Western Union. If you receive an unsolicited email alleging to be on behalf of the Red Cross or collecting for the Red Cross, do not respond to it or provide any personal details, but delete it immediately and do not forward or otherwise circulate it. Any emails requesting donations to us through any mechanism other than secure donation via redcross.org.uk or 0845 054 7200 are fraudulent. All British Red Cross marketing email addresses end @mail.redcross.org.uk and we do not use general email providers, such as BT Internet or Googlemail, to solicit donations. Do you publish your home address online? Facebook has caused no small amount of concern by quietly opening the address and phone number fields to developers. A post on Saturday by Jeff Bowen in Facebook’s developer support team explained that users’ addresses and mobile phone numbers are being made available on the development platform through a number of APIs. Users would have to accept a new app and allow it access to personal information. Contact details of friends would not be accessible unless they too accepted the app. But the primary concern, as neatly summarised by Graham Cluley on the Sophos blog, is that rogue app developers could efficiently harvest this very valuable information by developing apps that scrape this contact information and use it for spam or cold-calling. Facebook’s latest API allows developers access to users’ address and mobile number. This is clearly the downside of Facebook’s open apps policy, though it’s extremely unlikely Facebook would reverse that and head down the Apple road of approving apps – which has a whole set of different problems. Cluley suggests developers should only be granted access to this information if it proven to be a valid use, or that users should be asked to approve sharing this data. 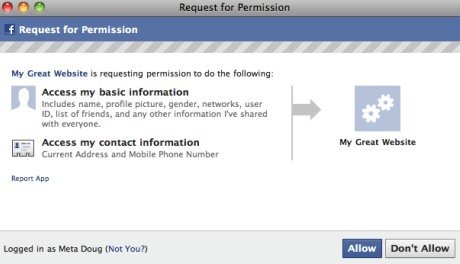 Facebook reminds us that there’s a difference between rogue applications and apps with a genuine reason for accessing your address or phone number. A spokesperson gave the example of an airline’s e-commerce app that could be more useful if it could notify users about last minute flight changes.